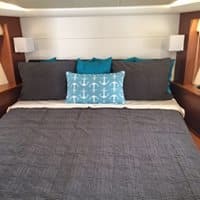 Prestige Yachts are so beautiful and modern that we like a minimal approach to bedding. 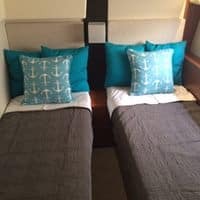 Custom mattress toppers throughout, custom boat sheets and simple Matelasse blankets give this boat a simple and practical design. Toppers add much comfort for a fraction of the price of a new mattress. Our toppers are beautifully quilted just like our mattresses. 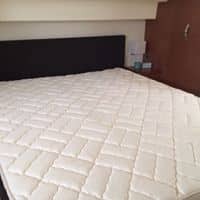 The toppers sit right on the existing pads and are kept in place with a custom sheet set that go over the existing pad and the topper. You’ll swear you have a new mattress! The cotton sheets and matelasse blankets are all machine washable, making this choice a no brainer for care. We have many Prestige models on file. Give us a call to see how we can help.